We showed di[3,5-diacetyl-1,2,4-triazolbis(4-cyclohexylthiosemicarbazonato) platinum( II)] complex, (W8), endowed with important antitumor properties. Here, we analysed whether W8 can affect human bone marrow-derived Mesenchymal Stem Cells, (hMSCs), involved in tissue repair, immunomodulatory properties and also capacity for homing to injure-tumor sites in ovarian cancer. Specifically, we analysed the effect of W8 on cell proliferation, response to scratch, and whether copper-derived cellular mechanism is used by this platinum(II) complex being studied. 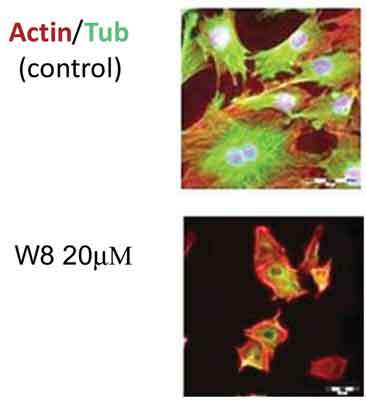 Results showed that W8 causes a significant inhibition of cell proliferation at µM concentration. This effect is directly related to the alteration of cytoskeletal proteins and inhibition of the response to scratch induced by the presence of foetal bovine serum. This strongly supports the notion of W8 triggers the energetic metabolism of hMSCs and adds an extra support by the results showing W8 relationship with the cellular copper ions. W8, acting in hMSCs, regulates in addition the inhibition of cell proliferation, the inhibition of tumor angiogenesis and metastasis. Cisplatin-resistant, mesenchymal stem cells, α-N-heterocyclic thiosemicarbazones, ovarian cancer cells. Departamento de Quimica Inorganica (Módulo 07), Facultad de Ciencias, c/ Francisco Tomas y Valiente nº 7, Universidad Autonoma de Madrid, 28049-Madrid, Spain.